SLEAFORD MODS are the subject of a new documentary film which is being unveiled to coincide with their biggest tour to date. 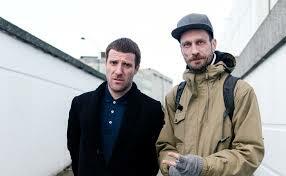 Sleaford Mods – Invisible Britain was directed by Nathan Hannawin and Paul Sng and follows the duo on a recent UK tour. The film is being premiered at screenings in Nottingham and London, which will feature Q&As with the directors. The London screening – part of the Doc’n’Roll Film Festival – is at the Picturehouse Central cinema at 3pm on Saturday 3 October. Tickets are available here. The Nottingham screening is at the Broadway cinema at 8pm on Saturday 10 October. Sleaford Mods’ Jason Williamson will also be participating in the Q&A. Tickets are available here. As previously announced, Sleaford Mods set off on tour this week, with support from STEVE IGNORANT’S SLICE OF LIFE (except Cambridge, Brighton and Nottingham). Tickets are available here. Full dates are…. Sleaford Mods’ Key Markets is available now through Harbinger Sound. ‹ GIUDA GET THEIR BALLS OUT!